Victor Hugo's 1862 novel Les Misérables is a literary giant. You're probably also familiar with its long-running theatrical adaptation, which has been treading the boards for over thirty years now. But have you ever played the Les Misérables video game? You really should. Especially since it's a 2D fighting game. The game is called Arm Joe. Why? Because in Japan, Les Misérables is known as Aa Mujou (Ah, Cruelty). Cute. Arm Joe isn't an official product, in case you hadn't sorted that out by now with the name and genre; it's a home-made title put together by Japanese indie developer Takase. So it's a little rough around the edges. Indeed, while casual gamers may enjoy it, purists will detest its stodgy controls and poor balance. But who cares. 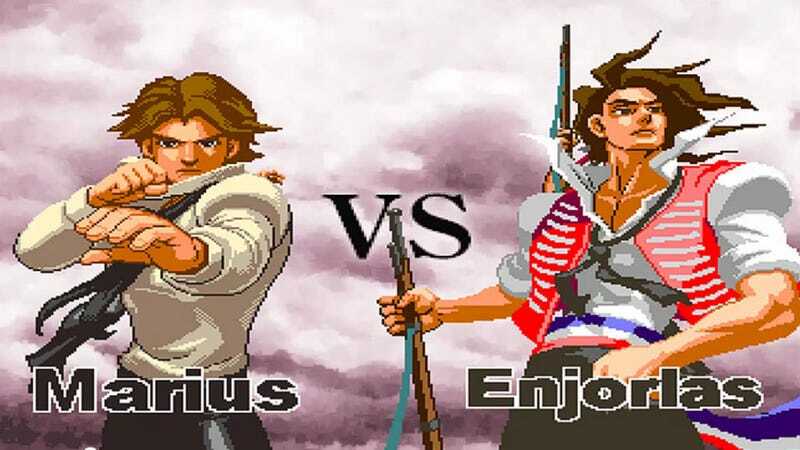 This is a 2D fighting game which features Jean, Javert, Cosette and Marius as playable characters. Which has a special attack unleashing a horde of revolutionary French soldiers. Which features Judgement itself as a fighter. There's even robotic characters. Arm Joe is a PC game, so you can download it and play it right now if you want. Being from 1998 you might have some issues running it on newer Windows platforms, though.